I slept in this bag only one night so far. Temp was -12 celsius and the bag performed very well. I slept comfortably wearing my winter top and bottom underwear, thick socks and a beanie. I don't know if the -18C rating is accurate, but at -12 in a humid environment (Adirondack Mountains, NY), it was fine. I just love the no frills, efficient design of that bag, which saves weight and a lot of $$$. (Thank you Golite for making such high quality products for so cheap). The hood works very well. This bag fits really tight around your body, especially from the waist down, so if you plan on sleeping with your boot liners, water bottle, spare batteries, wet clothes, etc. inside the bag with you, buy the long version. I'm 5'8" and with the regular lenght, the only room I have for those items is between my legs. I wish I had the long version for that reason. The other problem is condensation at the torso that comes from my breathing. The torso part of the bag was all wet when I woke up in the morning, which could become a problem on extended trips in the backcountry. At the torso area, I think Golite should have used the same water resistant material as they used for the foot and hood. I'd also like to have one or two pockets to keep small items. You will find none of that on the Adrenaline. No extra features. Great bag for the money. 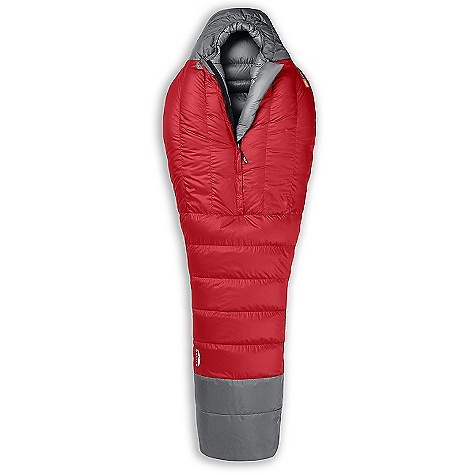 Great warmth, weight, and price that cannot be beat. very constricting, not much room to move about in. Have only used down to 24 degrees but was VERY WARM there. Bag is 800 count down, weighs in at 3 pounds for the long version, and does what it is supposed to do. Keeps you warm. Only downer (no pun intended) is that it is a tight fitting bag, done so to help keep the weight down. Outside of that, you cannot beat this bag, and it is available at $240 as of 11/21/12. Get one, you will love it. The GoLite Men's Adrenaline 4-Season Mummy is not available from the stores we monitor. It was last seen July 30, 2013	at CampSaver.com.